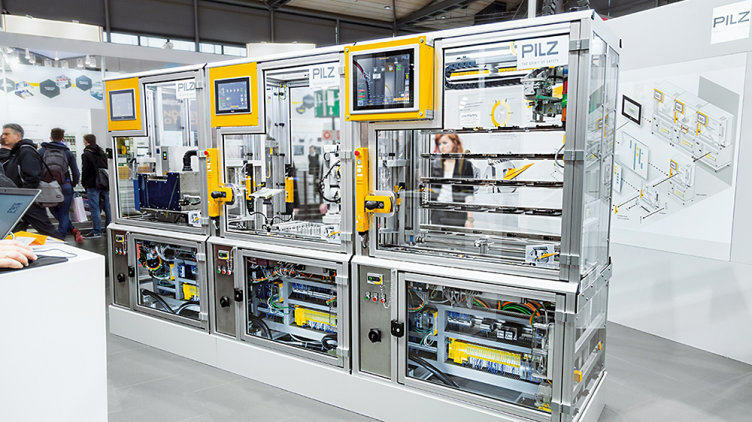 Visit us at SPS IPC Drives 2016 in Nuremberg and experience Industrie 4.0 at first hand with Pilz products! We are on Stand 370 in Hall 9, where you can see live how customised products in accordance with Industrie 4.0 can be manufactured in a way that's fast, flexible and cost-efficient. Our sensor, control and drive technology products work hand in hand. The Industrie-4.0-capable automation system PSS 4000 coordinates the sequence of all networked components. This guarantees safety and automation – from engineering through to visualisation. Our intelligent factory will be producing business card cases and pens engraved with your name. Information regarding which name is to be engraved on which product is conveyed to the workpiece carrier using an RFID chip. This ensures that all the details for the respective work stages are available in each module. As a result, the production line can react flexibly to individual customer requirements, without the whole project having to be changed. With our products and solutions it's easy to represent complex, digital, networked plant and machinery!